It feels like forever since I've posted one of these Reading in Heels box write-ups because wow it's been forever since I've regularly posted anything at all. But I'm hoping that I'm actually getting back into the swing of things this month. I mean, I'm posting this on the first of April so all in all this month I'm on a track record for posting on 100% of the days! Reading in Heels is a subscription box that I adore. It costs £12.80 (including postage), can be purchased as a one-off monthly package and contains a book alongside four or five treats. I've got six or seven of the boxes now, and of all the books I've read from them I've not had one disappointing read. They push me out of my comfort zone, feature strong female voices (either as the author, in the narrative, or both) and each one of them is completely different to the last. This month's book is House of Beauty by Melba Escobar. Set in Bogota, Columbia, the novel depicts a society in which murder isn't as abhorred and vilified as one might expect. The author looks at the intersections of race, crime, class and gender with a beauty parlour sitting right at the heart of the trouble. I honestly hold a great amount of trust for whoever chooses the books for each box, and the more I read about this book online, the more it sounds like I'll love it. As March held International Women's Day, this box had a little bit of a theme running through it. 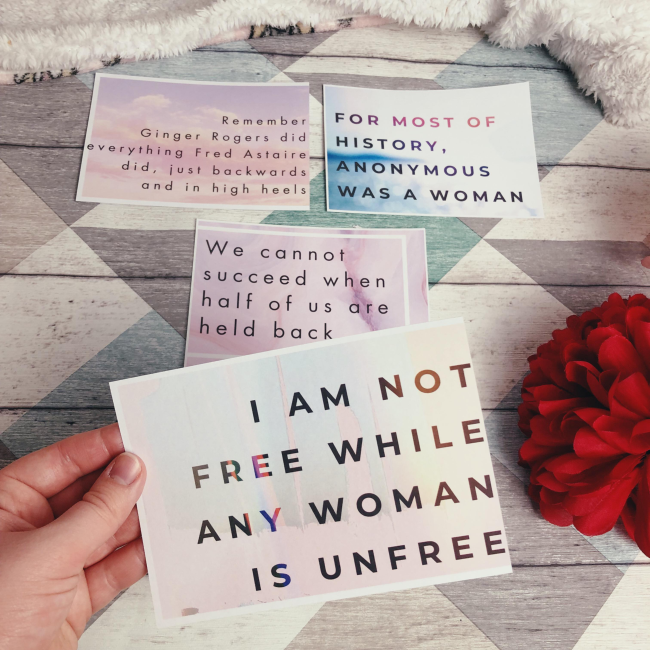 The postcards in the box were brilliant, and such a fab idea to send to key women in your life (though I've absolutely saved mine as bookmarks that offer a little extra motivation). I think the idea that 'I am not free while any woman is unfree' is so important because feminism isn't feminism if it's not intersectional. We've also got Shakespeare-themed chocolate. Sweet Theatre, the brand behind this choccy (that honestly tastes SO GOOD), have a whole range of leading ladies with their own chocolate bars. Juliet is white chocolate, Miranda is milk chocolate with sea salt, and so on. This one was Cordelia from King Lear, and it was caramel sea salt milk chocolate. It tasted divine and appeals to my endless love of Shakespeare. The wildflower seeds weren't really a part of the whole theme, but it's Spring and I'm very excited to get them planted. The Scentered sleep well therapy balm was also not themed but wow for the first time in my life I'm struggling with insomnia so basically I'll try anything at this point. And that's that! I've just ordered my April box and I can't wait to share that with you in a few weeks. That book sounds bloody brilliant! 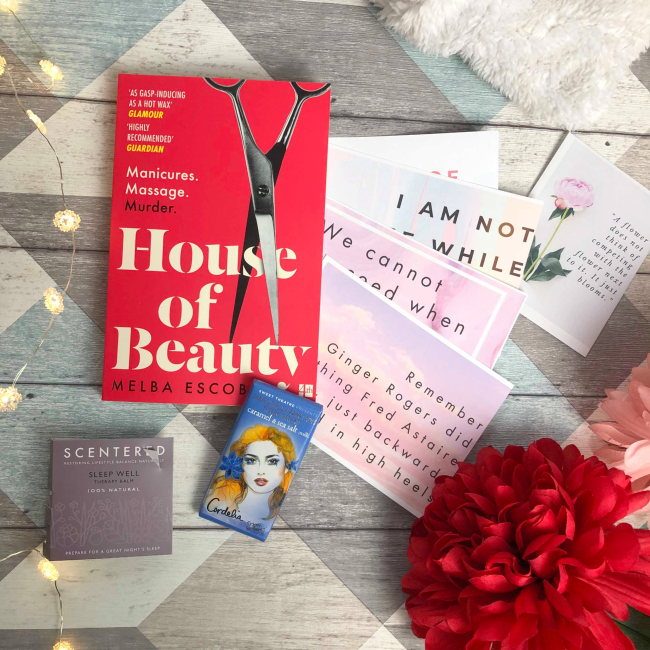 I've already got a massive list of books to get through thanks to your other book blog recommendations :) that is such a cute subscription box I might treat myself as a one off one month, the goodies seem fab and like you love the feminist postcards!